Readers, you know how I feel about stinky cheese. I always welcome it into my home. That is why there is a funeral-sized incense burner in my living room. Alas, my last Stinky Cheese Mission went awry, and I am still puzzling over it. Did I eat a bad piece of cheese, or is Handkäse really and truly intolerable? Okay. I like a fart joke. I’ll eat a farty cheese. 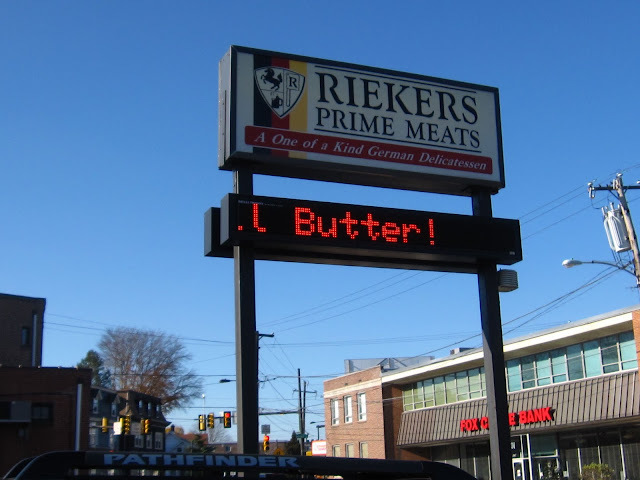 So off I went to Rieker’s Prime Meats, a German specialty foods store in the neighborhood of Fox Chase, Pa. I pictured a meaty fright wig of a cheese with a devilish rind, something akin to Limburger. I did not expect Handkäse to look umbilical, like a glassy Tootsie Roll. But, there it was in the cooler: slightly cloudy, tubular. Let it be known that I loved Rieker’s Prime Meats. I loved the cuckoo clocks, the German cookies, the fresh spaetzle and rouladen in the dairy case. 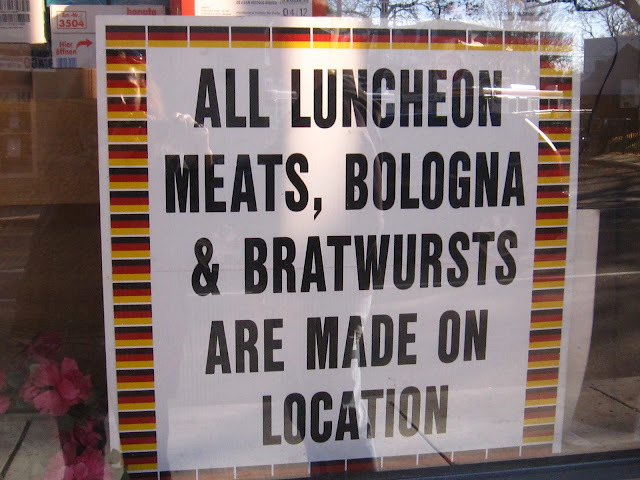 I bought bags of fresh pretzels, wursts, mustard in a toothpaste tube – all the family favorites. The only item I didn’t love when I got home? Handkäse. And it wasn’t the musik. 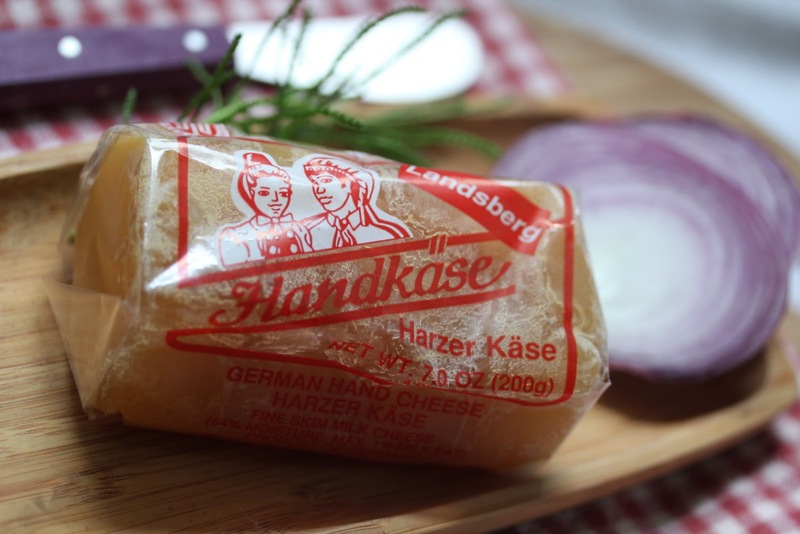 Handkäse is a specialty of Hesse, Germany, where it was originally rolled by hand, hence the name. According to Cookipedia, it’s a “smeared acid curd” cheese made from sour milk that is ripened for several days in a “sweating room.” New terms for this cheese geek. Acid curd? Sweating room? You get the picture. Handkäse did taste sweaty and acidic – like sour cream mixed with rubber cement. My first bite stuck to my front teeth like a fetid gummi bear. Terrible. I tried melting it, added onions – as others on the internet suggested – but oy vey, that only made Handkäse turn slimy. If Tolkein’s Golem character had tried ripening a cheese in his cave, it might have looked like melted Handkäse. Look at it. Tell me you don't think of Lord of the Rings. I’m headed back for some Limburger. I think I like cheese that smells like feet better than cheese that looks like a severed finger. But, readers, set me straight. Is there something I’m missing? Are there magical nuggets of Handkäse out there, or am I stinktarded? This kind of cheese must be a variant of the Hettekeis (Brusselse kaas or translated: Brussels cheese). The Hettekees was made out of 'skimmed' milk and a lactic acid coagulation, the curd manually rolled by hand and pushed in cheese moulds, heavily (dry) salted, then dried in open air and washed/ripened for 3 months. Then the Brevibactrium Linens rind was washed out completely which gave the cheese its final glassy appearance. "Brussels cheese or Hettekees refers to the hardness, pungent smell and sharp taste of the cheese. As the experienced gastronome knows, you must eat the Hettekees at breakfast. Sitting, with strong coffee. At breakfast because, once you do open the box, the smell instantly makes you awake. Sitting because it is difficult to stay on your feet next to such a perfume. And finally, with coffee, because every other drink pales, as you need something to drink to flush the salt . Wine tastes like tobacco juice beside it and beer looks like milk. Only strong coffee and old Gueuze beer can stand in the company of Brussels cheese. The Brussels cheese is full of character and you should, like him, be ripened to be able to enjoy it." Wow, thank you for the response! I am learning something new here. Much appreciated. May be you are interestd in my article of the Brussels cheese. Fantastic -- thank you for the translation! Tell me, Abitor, is that really a picture of you on your laptop surrounded by goats? I love it! Someone needs to revive Brussels Cheese. Who's listening? I want these stinky German cheeses in the SF BAy Area! Tenaya, I love your blog! Thanks for the hard truth. I have to say, I once met a cheese I thought I would never love, the torta del Casar. A friend gave me a whole wheel, and when I had my first whiff (and bite), I thought the ammonia would permanently end me. However, due to extreme grad school-induced poverty, I committed to eating the cheese as a protein supplement to my diet of baguettes and the cheapest vegetables I could find. It grew on me. By the end of the summer, it had become my favorite cheese. Now I try to smuggle a wheel or two home whenever I visit Càceres and gobble it like a fiend when I find it in the US. Maybe forcing it down your gullet a few more times will change your mind? Then again, maybe not. No amount of mushroom consumption would ever lead me to like the things :-). No, you're not wrong. Handkäse is truly vile. It tastes like extremely fetid old athletic shoes smell. Is there a point? I had handmade mit music when I was in Frankfurter. It was delicious. Didn't look like like those pics above. It came in a shallow bowl soaked in vinegar and onions and caraway seeds. Spread it on rye bread. 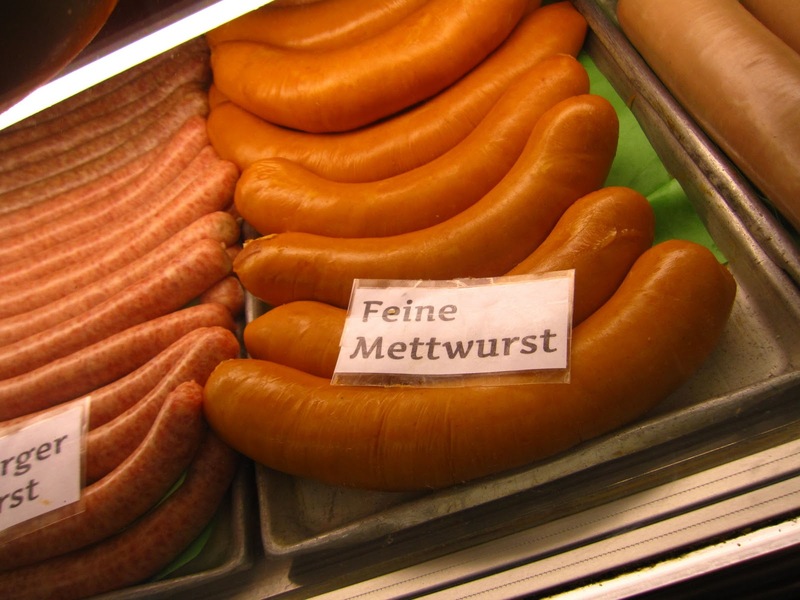 I had handkase in frankfurter and it did not look like these pics above. It was soft and served in vinegar with onions and caraway seeds. Eaten with rye bread and butter. I loved it! 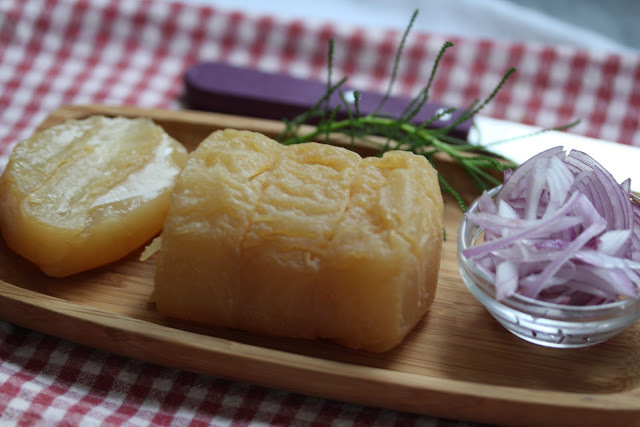 On my blog there is a little test of various Handkäse. But you will probably not find them in the US. I lived in the Hessen area of Germany. My neighbor would prepare the hand kaese very much like the link below. Stinky, yes, but when prepped correctly, quite tasty. I bought some today and it stunk my car up in no time on the way home! Lol! Making Thai food tonight so it'll have to wait until tomorrow. Stinkfest coming up!